Clorox bleach has been a staple in many laundry rooms for many years! While it is unbeatable for brightening whites, and removing stains from white clothing, it’s time to think beyond the laundry room, and consider its other uses! Clorox just added two new innovative products to their Bleach line: Clorox Zero Splash Bleach Packs and Clorox Control Bleach Crystals! Busy moms and dads no longer have to deal with heavy bottles of liquid bleach and spills that can cause some unintentional whitening. 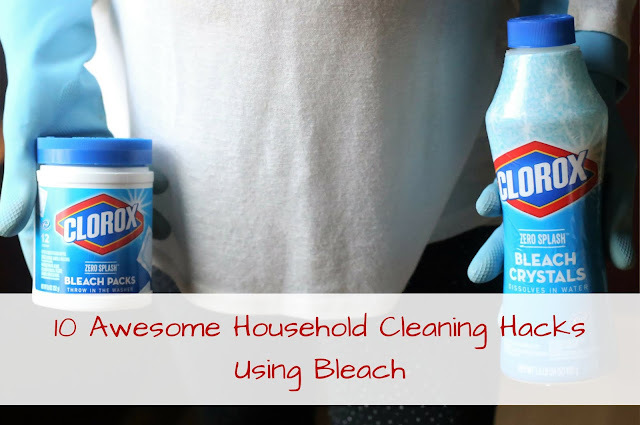 Clorox Bleach Packs and Crystals are lighter, easier, and more convenient, and the best part is that they can be ordered directly from Amazon! Who DOESN’T take advantage of Amazon these days?!? Clorox Control Bleach Crystals and Clorox Zero Splash Bleach Packs are unique, spill-free solutions that are water activated. They only start working when they are mixed with water! They are a much less messy alternative to traditional household bleach. Not only is it as affordable as Clorox liquid bleach, but it takes up less storage space, and can be easily shipped to your home from Amazon! *Please reference the Clorox website or the product labels for proper usage. There are easy mixing instructions for each intended purpose directly on the product labels, and you can find more information HERE. Nothing compares to the brightening, whitening, and stain-fighting power of Clorox bleach! With four (soon to be five) messy kids living within my home, it is a staple in my laundry room. Cleaning all of our whites is a lot easier now with Clorox Bleach Packs and Crystals. Instead of measuring out liquid bleach and pouring it into the dispenser, I can add the crystals and bleach packs directly to the washer drum! I no longer have to worry about splashes ruining the clothes that I am wearing, because the crystals and packs aren’t activated until they mix with water! When you live with children and pets, the hard surfaces within your home can get really dirty REALLY fast! When I want to deep clean my home, I trust Clorox bleach to get the job done quickly. It is great for cleaning countertops, cutting boards, butcher blocks, floors, toilets, sinks, and bathtubs. I can use the Clorox Zero Splash Packs and Crystals the same way as liquid bleach. For my floors, I measure the accurate amount and add it to the bucket, and I can also mix up a bleach solution and pour it into spray bottles for quick spot cleanings throughout my home. It makes hard surfaces shine, and I trust that they are clean for my family! Out of everything in our home, the trash cans are the items that need cleaned the most! Each week on trash collection night, our trash cans get sprayed with Clorox bleach and thoroughly wiped down before new bags are placed in them. This quickly gets rid of the disgusting food and garbage residue! Our glassware and dishes can get dingy after a few months. When that happens, I like to fill the sink with water, add Clorox bleach, and let the items soak overnight. The next day, I give them a wipedown and a thorough rinse. It never fails - they always look brand new! After a long Winter, our outdoor toys, fences, and furniture are ready for a thorough cleaning. A quick scrub down with Clorox bleach, followed by a rinse with the hose makes them look new and fresh for the warm weather ahead! The grout in bathrooms and kitchens has the tendency to look dirty over time. Spraying the grout with a bleach solution, allowing it to sit on the grout for a few minutes, then giving it a wipedown is one of my favorite whitening secrets! Because our bathroom window stays closed all the time, and the bathroom is always warm and moist, mildew tends to build up on the walls and ceilings over time. Just like with the grout, I spray the spots with a Clorox Bleach solution when I notice them, and allow the solution to sit for a bit. After just a few minutes, the mildew (or mold) stains can be wiped away quickly and easily! If you have a family, you know how gross sippy cups and reusable straw cups can get with regular use! Scrubbing them by hand or putting them in the dishwasher just doesn’t do the trick. Just like with glassware and dishware, filling the sink with water, adding bleach, then soaking the parts overnight will work wonders and remove all stains, mildew stains, and grime! I try to do this once a month with the rubber seals, parts, and straws to our sippy and straw cups, and soak plastic kids’ cups often. They always look brand new after this household cleaning hack! When you have young kids, bath toys are just a part of your life. Unfortunately they get really gross really fast! When I find myself pondering just how safe the bath toys are, I end up soaking them in a bucket filled with bleach solution overnight. This cleaning hack gets rid of any hidden mold or mildew stains, and makes the toys look like new. Plus, it gives this worrying mama peace of mind! Just like kids’ cups and bath toys, plastic toys become grimy from sticky hands! Sometimes when I’m picking up toys at the end of the day, I get grossed out by just how sticky and dirty some of our toys are. An overnight soak in a bucket or sink full of bleach solution, followed by a rinse and an air dry the following day is the perfect cleaning solution for plastic toys. And with all the germs kids tend to bring home, regularing cleaning the plastic toys makes me feel like we’re living in a healthier home! *These are just suggestions on how I use these products within my home. Please consult the product packaging, and use as directed. These are just a few of the ways we use Clorox Bleach within our home! 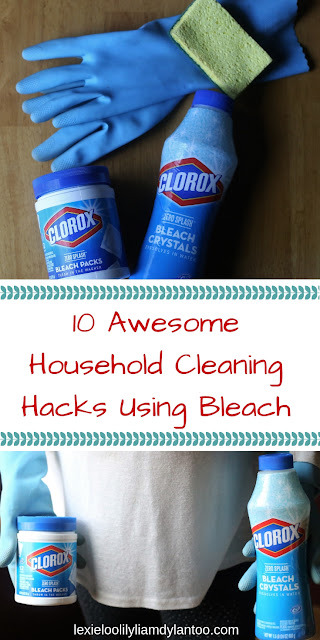 I was always a Clorox Bleach user, but their awesome new Zero Splash Bleach Packs and Crystals make my life easier. I hate dragging my entire crew out shopping for cleaning supplies, then hauling everything home, so being able to order my cleaning staples through Amazon is a game changer! It saves me time and money, and helps me focus on what truly matters: my growing family! How do you use bleach within YOUR home? Let me know in the comments! Discover the power and innovation of Clorox Zero Splash Bleach Packs and Clorox Control Bleach Crystals by visiting Amazon.com now! I like the idea of using it to clean the trash can. Nice tips. Thank you, Lauren! Our trash can is always so disgusting...I blame my kids! All the things you listed are things I least want to clean, but I'm sure bleach would be perfect for cleaning them! Haha! I am 100% with you!